How does Nuga Best work? Just as a tree needs a strong root system in order to grow properly and sustain good health, the same concept may be employed for the general well being of humans. The human root system is comprised of the Central Nervous system (brain and spinal cord) and the Cardiovascular system, which are the first two to develop within the human fetus. Everything else in the body develops subsequently from these two. In conjunction with one another, they bring oxygen, water, nutrients, hormones, and Qi to every part of the body as well as excreting post-digestive substances and metabolic waste. When these two systems are healthy, a human being will be healthy. With clean blood vessels free from harmful accumulations and free flowing Qi allows one to improve one’s health to its optimal level, therefore allowing our bodies to function as nature intended. Given the many stresses we encounter daily in today’s busy society, combined with poor dietary habits and lack of exercise, most of us tend to collect plaque, cholesterol, fatty deposits, and toxins causing fat buildup and blockages of arteries and veins as well as blockages of the energetic pathways within our nervous system. We also tend to suffer from a general deterioration of the spinal column as we age. In other words, our root system begins to deteriorate and the damage done begins to undermine our overall health. The good news is that Nuga Best Jade Thermal Massager reaches directly to the source of these health problems, the human root system itself. As the weight of the body pushes against the bed, the helium light bulbs heat the jade rollers and emit far-infrared rays as it moves in an up and down fashion, along the sides of the spine, conforming to its natural contour. These rollers transmit a highly therapeutic form of heat and light deep into the body, possessing both massage and acupressure functions. This process accomplishes several things: First, it relaxes the muscles and tendons along the spine, allowing the vertebrae to gently and gradually align themselves. Secondly, it stimulates major acupuncture meridians within and along side the spine, causing powerful bioelectrical impulses to course along the extensive network of nerve fibers. This ultimately energizes every system and organ in the body. Blood circulation is accelerated by the heat; causing blood vessels to dilate while, at the same time, assisting in dissolving and flushing out the harmful clot factors that accumulate in the circulatory system. Additionally, the increased temperature in the back and pelvic region facilitate our bone marrow to generate healthy new blood cells. Over time, as the vital life force energy (Chi) and blood begin to flow more freely and smoothly throughout the body, one feels rejuvenated, stronger, and psychologically healthier so one can tolerate the daily strenuous high demands of the modern lifestyle. The Light Projector, created of ergonomic design and Nuga’s modern medical science, provides excellent help to stimulate nerves, relax muscles, and relieve fatigue. And, massage effects are also provided. The benefits of massage therapy are widely known and go well beyond simple enjoyment. Some of the effects are: relaxes the muscles and tendons, increases flexibility, reduce anxiety, improvement in insomnia, balances the muscles, increases circulation and blood oxygenation, reduces pain. Many, many more benefits have been reported. Nuga Best NM5000 applies massaging action on the spinal joint surfaces that often experience nerve suppression due to deformation of the vertebrae. Removing such nerve suppression helps the joints return to their proper positions. Beneficial effects from this characteristic include revitalization of various body organs, enhanced metabolism and blood circulation, as well as the removal of blood clots and body fat. Through these effectsNuga Best NM5000 helps you attain and enjoy better health. By relieving the tension built in Meridians and the muscles and tendons around the spine, NM5000 relieves fatigue, allowing you to enjoy a vibrant life. Tourmanium Ceramic Disks and Helium Light Bulbs generate the mystical Far-Infrared Rays, which produce results of maturation, self-cleansing, moisture control, neutralization, and resonance within your body. Low Frequency Pad (also called the Diet Pad) applies Auto Tens principle of health waves to control weight, decompose body fat, and improve skin beauty. This function is another advantage over competitors, limited only to Nuga Best.. The Five-Ball Projector, designed to minimize the loss of heat and Far-Infrared Rays, can be placed on various body parts to improve blood circulation, dissolve hidden blood clots, and quickly relieve fatigue. 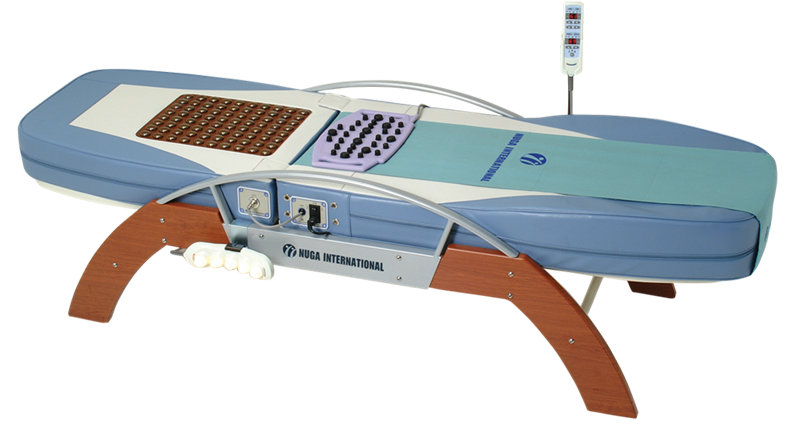 Massage Beds are state-of-the-art Complimentary and Alternative Medicine technology. As you lie down and relax, helium heated jade rollers slowly massage your back and neck, loosening tense muscles. Your body is soothed and bathed in beneficial far-infrared rays... the Light of Life. You'll enter a deep state of relaxation... stress, tension, aches and pains melt away. Massage Bed Systems may be your key to a less stressful, happy, and healthy life by providing you with regular life enhancing, soothing, and refreshing thermal massage sessions.